You must have heard about daab chingri and that is one of my favourite prawn recipe too. Inspired by the classic recipe, I recently cooked daab paneer and loved it so much that it has become quite regular on my table. Tender coconut is a great thirst quencher, a delicious blend of electrolytes that nature has packaged so wonderfully for us. 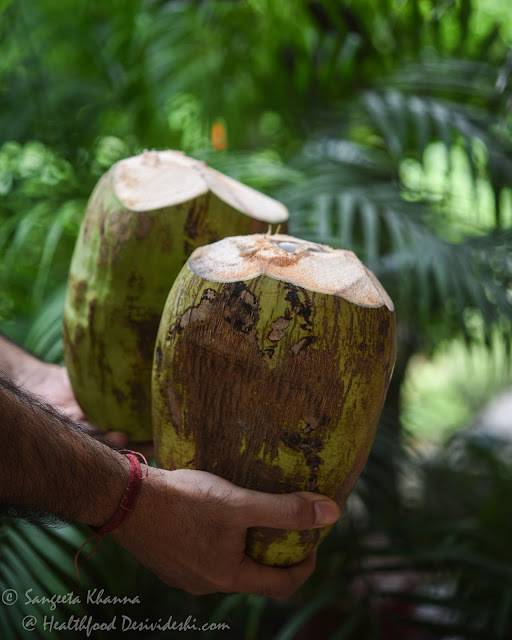 Daab, as tender coconut is called in Hindi and few other regional languages, has been the favourite drink whenever we can get it. Few decades ago we used to get daab only when we traveled to coastal towns but thankfully it is available in cities like Delhi fairly easily. To me it feels like a wonder every time I sip from a tender coconut, right since my childhood. 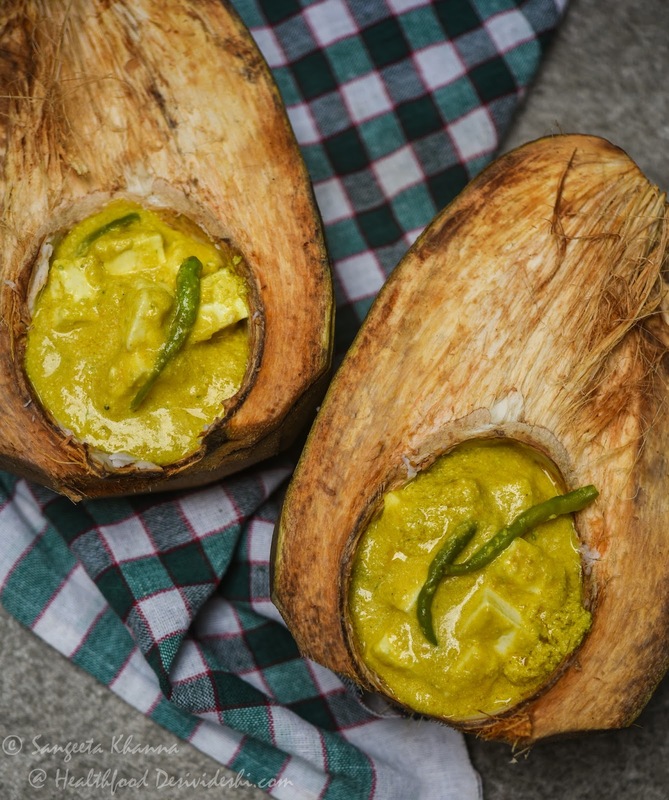 Each tender coconut packs a different flavour if you consider the minor variations of sweet and salt, the mineral taste and of the course the malai (tender coconut meat) that lines the inner wall, like a surprise unfolding gently. Tender coconut was our saviour last year when both of us were hit by chikangunia together. We had asked the neighbourhood daab wala to deliver 2 tender coconuts every morning and evening and that helped us a lot in recovering from the most annoying sickness we have had. But then we made friends with this daab wala and he is always ready to deliver at home, he will come with his cleaver sometimes and cut open the daab so we can eat the malai as well. All those tender coconut shells went into my compost heap but then I decided to make a raised bed using them, the next garden project. About that some other time as I am sharing a daab paneer recipe with you right now. I had eaten daab recipes in hotels and restaurants in the past but never had bothered to cook anything with them at home, apart from adding the tender coconut meat to some of my kheer recipes. When I saw a daab chingri recipe by Ipshita Bhandari on a facebook group I felt tempted to try that at home. After all I have easy supply of daab and the daab wala ready to cut it into convenient halves. 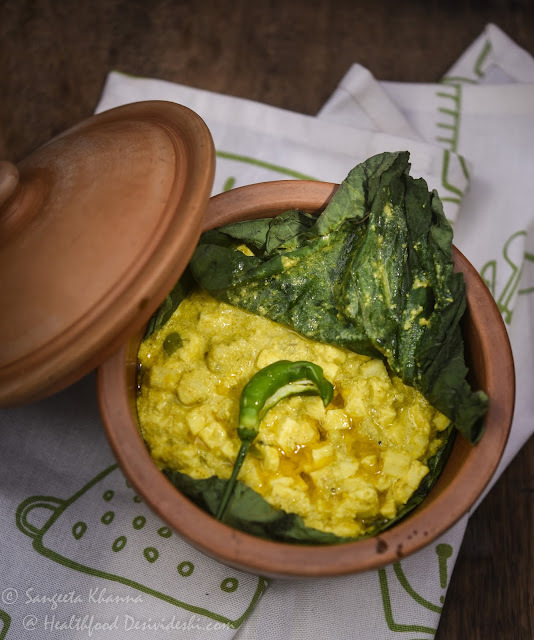 The Bengali daab chingri is a popular dish, easy to cook but the daab is such an exotic ingredient that everyone serves the daab chingri with a certain sense of pride. I am a sucker for easy recipes with clean flavours, thankfully this recipe was appreciated by everyone who tasted it. In fact for a week I was on a spree to cook with daab malai and found the right balance that works for my type of palate. The balance of mustard, green chilies and tender coconut meat, the three crucial ingredients of this secret sauce is a distinct personal choice according to the extent you can take the pungency of mustard mixed with the heat of green chilies. 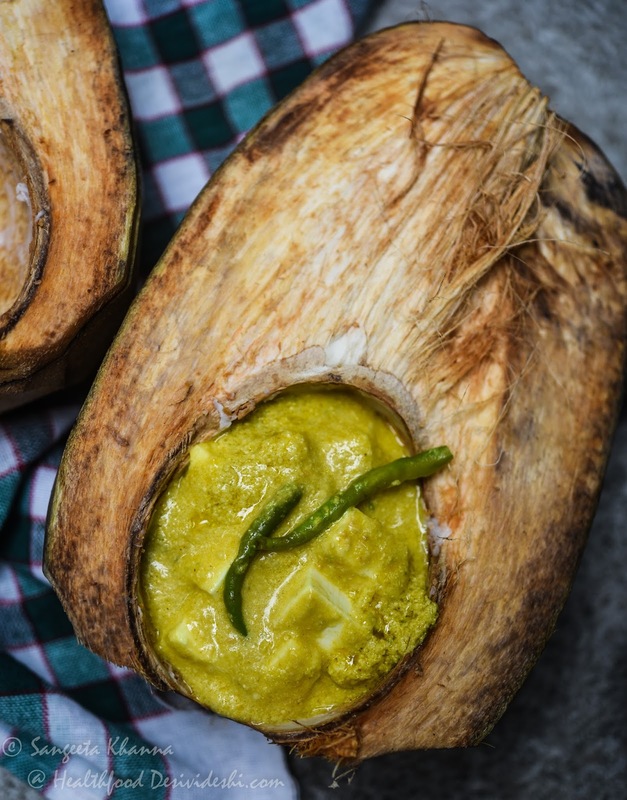 The fresh daab malai (tender coconut meat) renders a unique sweetness to this dish and that’s where lies the specialty of this dish. Take care to ask your daab wala to chose a daab with soft but generous malai in it, if it has lesser malai just consume it as is, if the malai has turned meaty you can snack upon it as we need the firm yet jelly like malai for this recipe. If you are making daab chingri or daab paneer for a crowd you can use a mix of tender and not too tender coconut meat as that will maintain the flavour. Separate the water and the malai of the daab, save the water and chop the malai in small bits. Make a paste of mustard, garlic cloves and green chilies along with turmeric powder. Powdering the mustard seeds first and then adding some water and other ingredients helps make a smooth paste. Chop the paneer in small bits too. Mix all the other ingredients together, along with half of the mustard oil. Add some of the coconut water to make the consistency as required. You need a mix with saucy consistency. I added coconut milk from a carton for this step every time as I can’t not drink the coconut water. I found the coconut milk made this recipe even better. For cooking the daab paneer you can follow any* one of the following procedures. *Transfer the mix to the emptied halves of daab, cover with aluminium foil and bake it for 25-30 minutes at 180 C.
*Transfer the mix in an earthen pot lined with bottle gourd leaves or fresh turmeric leaves, cover wit the same leaves, fix the lid and bake for 20 minutes at 180 C.
*The earthen pot can be placed in the microwave oven and cooked at high for 5-7 minutes. *Transfer the mix to a steel dabba, cover with lid, keep the dabba in a pressure cooker which has ½ cup of water in it and pressure cook till the first whistle blows. Cool the pressure cooker on its own and open the lid. After cooking with any of the above process, open the lid and garnish with a few slit green chilies and a drizzle of the remaining mustard oil. Serve hot with steaming hot rice, preferably short grain rice like gobindobhog or jeerabatti. I was suggested by Ipshita that it is better to cook it in the daab shell to bring the rustic flavour but I found it good even when I cooked the mix in a steel container or an earthen pot lined with fresh bottle gourd leaves. This is a recipe that one can adjust according to personal choice of the cooking vessel used, but please don’t distort the golden trinity of mustard paste, daab malai and green chilies. This daab paneer recipe will become a family favourite if you like the flavours of mustard. In this recipe the pungency of mustard is quite sublime due to the daab malai used. Please try the recipe and let me know.